Ghana is a gem of Africa. It’s one of the most popular destinations for tourism on the continent. Ghana is located on coast of West Africa, bordering the Atlantic Ocean. Ghana’s popularity comes from its development. This country is one of the most prosperous countries in Africa which can be seen all throughout Ghana. Ghana is a large country so it’s often divided into various regions for tourism. Each region offers a unique experience. Ghana has a great mix of natural wonders and parks, architecture, even UNESCO World Heritage Sites. It’s a place where you can experience major city life such as in the capital Accra, or enjoy the beautiful scenery on one of the many coastal beaches. There are endless things to see and do but these iconic landmarks will surely be at the top of your bucket list. Cape Coast Castle is one of the most well known landmarks in Ghana. This site, along with several other castles in forts, is actually recognized as an official UNESCO World Heritage Site. The Cape Coast Castle is a large castle located right on the coast of Ghana. This location made it a very important factor in the history of Ghana. The Cape Coast Castle was a major trading station between Africa and Europe. It originally began as a trading post for timber and gold, but eventually held a significant role in the Trans-Atlantic Slave Trade. 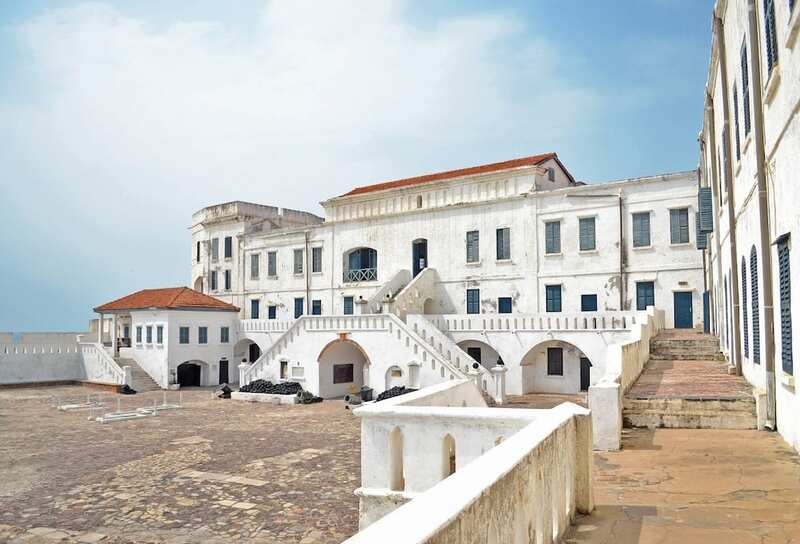 The Cape Coast Castle expanded to include a dungeon which was used to hold captured slaves. This castle became public property after Ghana’s independence and both the castle and dungeon were restored. Now, the site is open for tourism including both the castle and dungeon for visitors to learn more about its history. Africa is known for it’s vibrant wildlife. 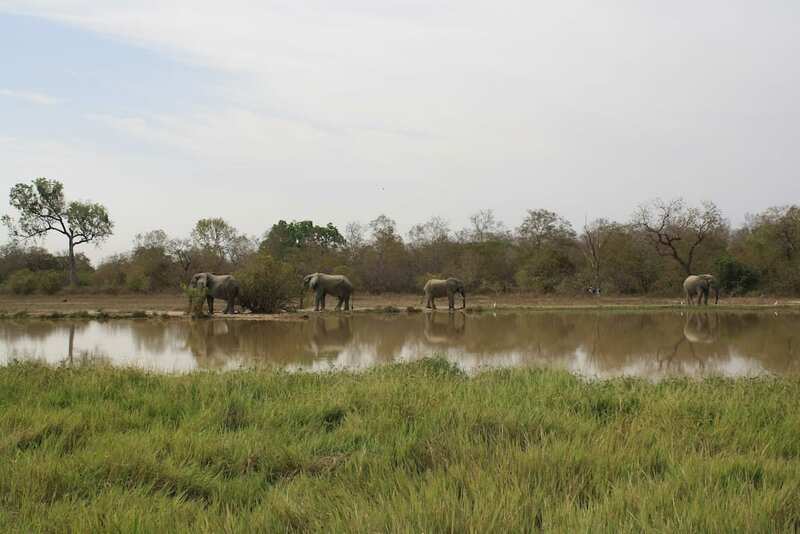 The Mole National Park in Ghana is the largest national park in the country. The variety of wildlife found here make it the most popular as well. Mole National Park has a range of wildlife offerings, from mammals to birds to even plant life. The park has close to 100 species of mammals including lions, elephants, monkeys, buffaloes, and much more. It’s also home to over 300 species of birds, some of which are endangered. The park stretches across and impressive landmass and contains over 700 different types of plants and trees. Tour guides are required to navigate around the large park. You can choose to experience Mole National Park with driving tours, on foot, at night, or even atop one of the tree-house viewing locations. The National Museum of Ghana is the perfect place to visit to learn about a lot of Ghana’s history. This large museum is located in Accra. It opened in 1957, making it the oldest museum in the country. It’s opening coincided with Ghana’s independence. The museum covers three main areas of Ghanaian history, including art, ethnography, and archaeology. The objects represented in these reflect all aspects of Ghana, from the landscape to how the civilizations developed into what you see today. The National Museum of Ghana holds predominantly contemporary artwork found around the country. This includes a mix of paintings, sculptures, and even traditional masks. The ethnography objects are relics found dating back to ancient civilizations. You’ll see a variety of clothing, instruments, and handicrafts. Black Star Square is also known as Independence Square. Ghana gained its independence on March 6, 1957. The square was completed in 1961 to commemorate their independence. This square is located in Accra and is an iconic landmark for Ghana. 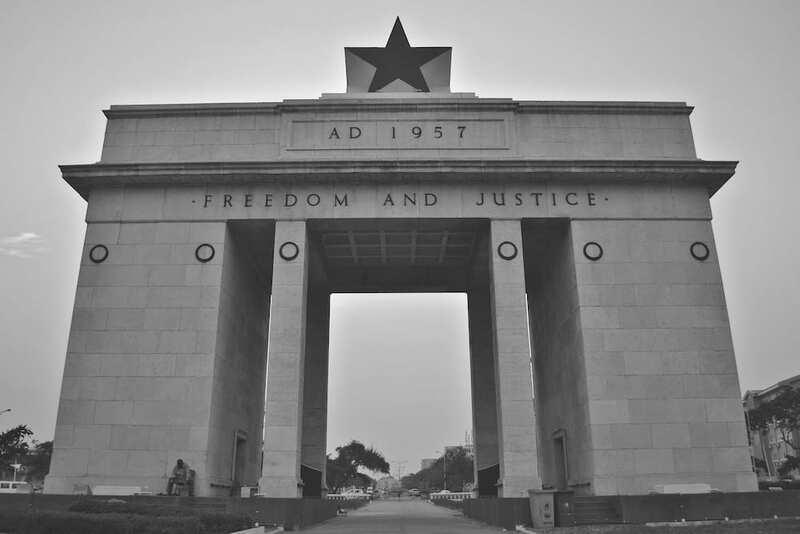 The park holds two main structures, the Independence Arch and the Black Star Monument, which is also called the Black Star Gate. Black Star Square is a public park and always has a lot of activity happening at the site. Every year on March 6th is their independence parade which is held here. The park has seating stands which hold 30,000 people. In addition to the parade, it’s also where the country holds many large public gatherings throughout the year as well as major national festivals. Located right next to Black Star Square is another nationally recognized landmark known as the Kwame Nkrumad Mausoleum. 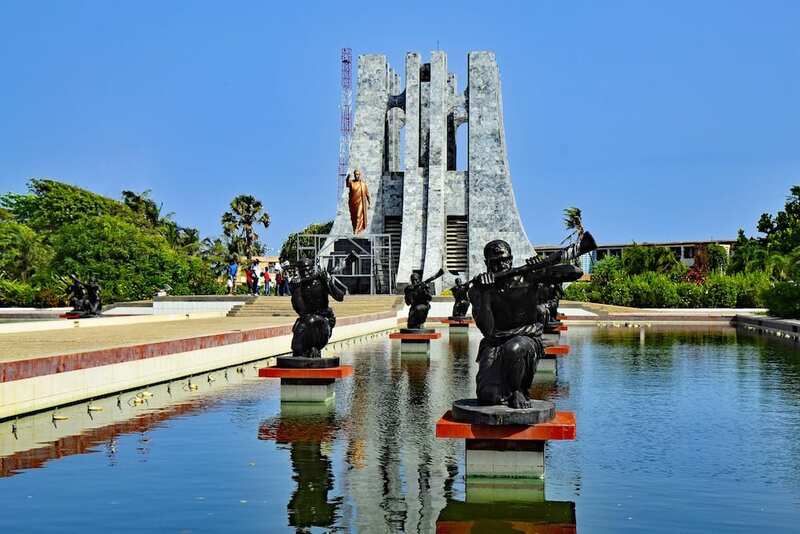 This monument was build in dedication to Kwame Nkrumad, one of the most prominent leaders in Ghanaian history. He is also the person who commissioned Black Star Square to be built after the country’s independence. The entire mausoleum is built with symbolic meaning. The main monument is constructed from Italian marble on the interior and exterior. It’s designed to resemble and upside-down sword, which is a symbol for peace. On the top of this monument is the iconic black star which is a symbol of unity. Lastly, the monument is completely surrounded by water, which translates into a symbol for life. The mausoleum also serves as a memorial. The inside of the monument is the actual grave site where Kwame Nkrumad and his wife are buried. The Ashanti Kingdom was a major empire in Africa’s history and was located in present day Ghana. The Ashanti culture is still prominent in Ghana and the region is still recognized as Ashanti. The capital of the Ashanti Kingdom was in the now Ghanaian city of Kumasi. Kumasi is now one of the major metropolises in Ghana and is where you will find the Manhyia Palace. This palace is significant because it is the official residence of the Asantehene, the rule of the Ashanti Kingdom. The Ashanti Kingdom was so influential that the culture is still maintained, and therefore the palace is a current residence for an Asantehene. The original palace was destroyed so he resides in a new palace built on the same grounds. The old palace was eventually rebuilt and is now a public museum. The museum includes many objects from Ashanti royalty and culture. The palace grounds are also he site of many traditional Asante events held throughout the year. Religion has played a major role in the development of Ghana. 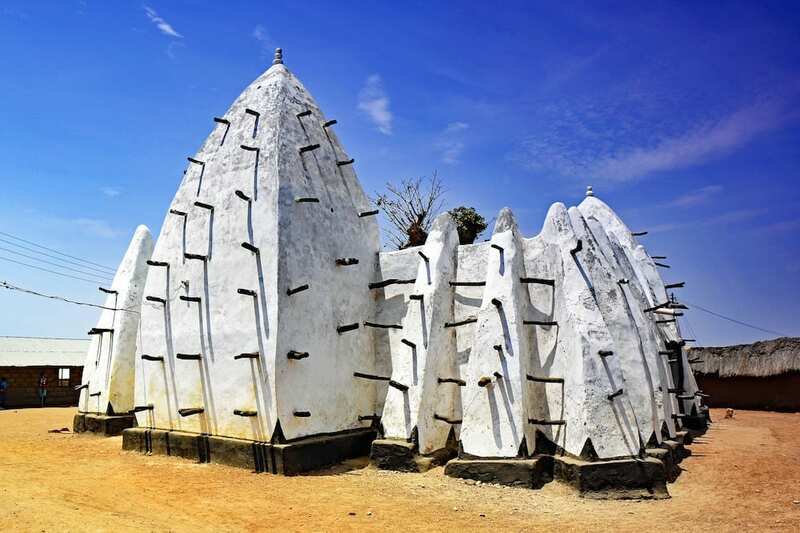 Islamic influences can be seen across the country and in the northern village of Larabanga, you will discover the Larabanga Mosque. This mosque is known as the “Mecca of West Africa” and is the site of many pilgrimages to the area. The Larabanga Mosque was built in 1421. This makes it the oldest mosque in Ghana and one of the oldest in all of West Africa. The mosque is actually small in comparison to other regional mosques but still hold significant religious meaning to those practicing Islam. The entire structure is designed in Sudanese architecture and is a notable white color. The village of Larabana welcomes tourist who come to visit the mosque and even has established economic activity to support the continued upkeep of the mosque. Ghana has a lot of natural beauty being located on the coast. The inland of the country also holds many hidden gems to discover. One of the most iconic natural landmarks in Ghana is the Kintampo Waterfall. This waterfall is the highest falls in the entire country. Kintampo Waterfalls is a tiered waterfall with water cascading down numerous “steps.” The entire drop is approximately 70 meters, or 230 feet. The waterfalls is a part of the Pumpum river and is hidden within a forest. The falls are relatively easy to reach as it’s close by to a major highway. Ghana is a large country with lots discover in every corner of the country. The capital of Accra has a lot of nearby attractions surrounding the city. Venturing around the rest of the country will reveal other must see attractions. Ghana is a place with a lot of history, from which many landmarks are derived, but also the continued development of the country makes it a great place to experience. From man-made attractions to natural wonders, Ghana is a place to explore it all.